Wrapping up the 10-man squad of Topps 1965 All-Star Rookies is outfielder Ron Swoboda. 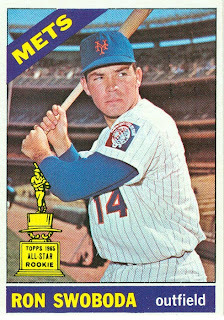 Ron was signed by the Mets in September 1963, and after one season (1964) in the minors, he debuted with the Mets in April 1965, at age 20. During his first 2 seasons, he was the primary left fielder, playing 135 games as a rookie while sharing the starting job with Joe Christopher. 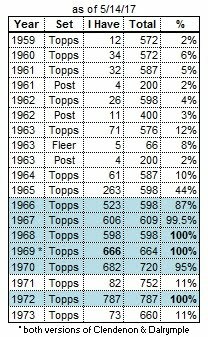 In 1966 he appeared in 112 games, starting 80 games in left. With the Mets' acquisition of Tommy Davis from the Dodgers, Ron moved over to right field in 1967, and was the regular for the next 4 seasons, including his famous defensive exploits in the 1969 World Series. 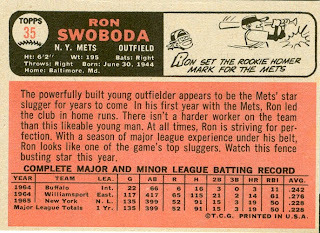 During spring training 1971, Swoboda was traded to the Expos for outfielder Don Hahn. By mid-season, he went to the Yankees in exchange for outfielder Ron Woods. Ron played 2 more seasons ('72-'73) as an outfield sub with the Yankees, and spent part of 1973 with triple-A Syracuse. The Yankees released him in December 1973, but he was picked up by the Braves a few weeks later, only to be released in spring training. 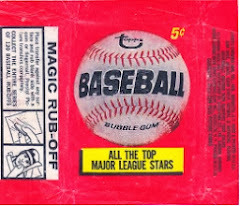 I had this card as a kid. I always thought Ron looked super cool. The first Met who didn't look old, out of shape, or a college professor dressed in NY uniform. I love this card as well. I used to have it as well. It was cool and I loved the big trophy on it as well. 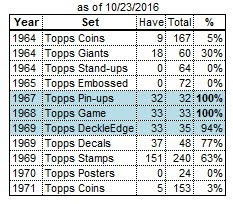 I did not care for the smaller trophy's Topps put on the All Star Rookie cards in the early 70s.